"This recipe is inspired by both Jaime Oliver's Creamy Shells and Peas recipe and a local restaurant's version. However, I've never been tempted to make Jaime's; I'm sure it tastes awesome but I decided to tweak it to my heart's content. Mine is very fast to make and very fresh tasting." Place bacon in a large saucepan and cook over medium-high heat until bacon is evenly browned, about 10 minutes. Stir occasionally while cooking. Drain the bacon grease from the pan, and transfer bacon to a paper towel-lined plate. Bring a large pot of water to a boil and stir in asparagus and peas; stir occasionally and cook until the vegetables are slightly softened but still bright green, about 5 minutes. Drain and set aside. Cook and stir onion until translucent over medium heat in the same pan as bacon, about 5 minutes; stir in asparagus, peas, and bacon pieces. Squeeze lemon juice over the asparagus mixture; season with salt and black pepper. Bring a large pot of salted water to a boil and stir in the fettuccine; cook, stirring often, until fettuccine are tender, about 5 minutes. Drain well. 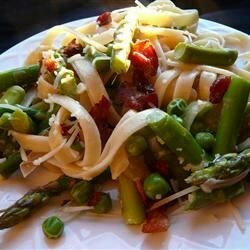 Stir hot fettuccine into the pan with asparagus mixture over medium-low heat and toss gently to combine. Stir in cream and bring mixture to a simmer. Sprinkle cheese blend over the mixture and allow to stand until the cheese melts, about 5 minutes; stir cheese lightly into the fettuccine and vegetables to serve. Really liked this. I didn't blanch the veggies- only cooked in the saucepan. Also, I had 3 tomatoes to use up so I threw them in. This Resulted in a yummy tomato cream sauce.